Pallet dispenser automatically dispenses (2) way, (4) way or nestable OSB pallets into filler. 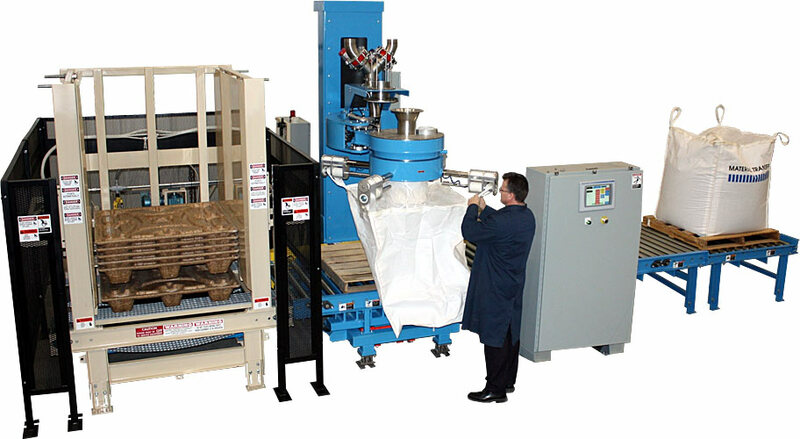 750 cfm bag inflation system removes folds and creases in liners for maximum fill volume. Adjustable high output electric densification system settles products for enhanced stability. Power-Lift™ system positions fill head at proper height for ergonomic bag connection while standing at floor level. Exclusive Power-Sweep™ system extends bag fill carriage 24” towards operator for reach-free bag attachment. Easy-Load™ bag hanger system rotates allowing operator to connect all four bag loops while standing in one position. Inflatable USADA/FDA approved seal creates a dust-tight connection between the filler inlet tube and bulk bag fill spout. Drum liner inflation ring provides easy, dust-tight filling of lined drums. Mettler-Toledo gain-in-weight scale system with stainless steel weigh modules. NEMA 4 controls with A/B Control-Logix PLC, and PanelView Plus 1000 color operator interface. Powered roller conveyor in filler base, plus three (3) zone accumulating discharge conveyor.